COCOA, Fla. (AP) — The Florida Highway Patrol says an 11-year-old boy was seriously injured when the golf cart he was driving overturned on a central Florida street. PALATKA, Fla. (AP) — Authorities say three men were killed when their flatbed truck hit a semitruck on a Florida road. CHRISTMAS, Fla. (AP) — The Florida Highway Patrol says a van struck three people who were standing beside their disabled vehicle, killing two of them and seriously injuring a third. MIAMI (AP) — Authorities say a Florida Highway Patrol trooper fatally shot a motorist near a park and ride parking lot north of Miami. PORT ST. LUCIE, Fla. (AP) — A fiery car crash has killed four people in a small beach town in Florida. ORLANDO, Fla. (AP) — The Florida Highway Patrol says a bicyclist was struck by a SunRail train and later died. TAMPA, Fla. (AP) — An off-duty paramedic giving first aid to an accident victim on the side of a busy Florida highway was struck and killed by a passing motorist. BONITA SPRINGS, Fla. (AP) — The Florida Highway Patrol says a bicyclist riding on a sidewalk has been hit and killed by a car veering off the road after a crash. SEFFNER, Fla. (AP) — The Florida Highway Patrol is looking for a pickup truck driver they say hit a man who was crossing the street and then backed up and hit him again. 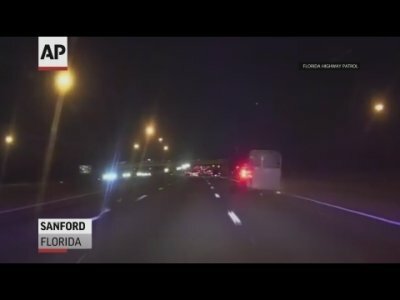 TAMPA, Fla. (AP) — A former captain of the Tampa Bay Lightning has suffered minor injuries in a bus pileup on a Florida highway. The Florida Highway Patrol says 38-year-old Vincent Lecavalier and two other men were taken to the hospital Saturday following the charter bus crash. Lecavalier's agent told The Associated Press in a text message Sunday that the former center was OK. He played in the NHL for 17 seasons, including 14 with Tampa Bay. AVON PARK, Fla. (AP) — Authorities say a 58-year-old woman has died after an all-terrain vehicle driven by a child crashed and fell on her. According to a WFTV report , Laura Bizzell of Avon Park was a passenger on the ATV when it crashed Saturday in Osceola County. DAYTONA BEACH, Fla. (AP) — Investigators say a 27-year-old Florida man caused a crash on Interstate 95 and then stole a pickup truck from a man who stopped to help. Florida Highway Patrol Lt. Kim Montes said in a statement that 27-year-old Zachary Searls hit a van in front of him Monday night. Searls' car then hit a tree and caught fire. Montes says 52-year-old Felix Coffman stopped to help. When Coffman got out of his truck, Searls got in it and drove away, Montes says. FORT MYERS, Fla. (AP) — Authorities say a 9-month-old girl has died several days after a crash on a Florida higway. The News-Press reports that the infant, Hida Jolin Mateo, was pronounced dead Saturday. Florida Highway Patrol says 58-year-old Johnny Coleman, who was driving another vehicle, died shortly after the Wednesday morning crash. DELAND, Fla. (AP) — Authorities say a 24-year-old Florida woman has died after crashing an all-terrain vehicle on Christmas Day. Florida Highway Patrol Lt. Kim Montes says Ashley Mae Creech was driving the ATV with four passengers on a dirt path near DeLand. BOYNTON BEACH, Fla. (AP) — A police report says two 23-year-old Florida men died at the scene of a Christmas Day crash on Interstate 95 that may have involved alcohol. The Florida Highway Patrol says Luis Pablo Ramos and Domingo Pablo Bautista were passengers in a vehicle that rolled over several times in Boynton Beach. News outlets report the crash happened around 3 p.m.
LAKE PLACID, Fla. (AP) — The Florida Highway Patrol says four people died in a head-on crash on Christmas Day. Sgt. Steve Gaskins said in a news release that a man driving a Buick was in the wrong lane of traffic as he approached a curve on State Road 70 near Lake Placid in central Florida on Tuesday afternoon. His vehicle collided with a vehicle that was traveling in the correct lane. BOCA RATON, Fla. (AP) — Three people died in a fiery wrong-way crash on a Florida highway offramp. The Florida Highway Patrol says 35-year-old Christopher Alfeo drove his 2012 Kia Optima up an offramp in Boca Raton, crashing head on into a 2018 Hyundai Sonata driven by 57-year-old Brenda Walker. LAKE BUENA VISTA, Fla. (AP) — A driver of a Walt Disney World bus was ticketed for careless driving after a crash that sent 14 passengers to a hospital with minor injuries. ST. AUGUSTINE, Fla. (AP) — Florida Highway Patrol says a drunken woman has crashed into a family of four, killing a passenger who was also a sheriff's bailiff. News outlets report 46-year-old Kim Johnston has been arrested and charged with driving under the influence in the early Sunday crash near St. Augustine. Troopers say Johnston was driving on Interstate 95 when she crashed into an SUV carrying a Jacksonville sheriff's deputy, a bailiff and the couple's two children. SANFORD, Fla. (AP) — A lemur surprised a Florida Highway Patrol trooper when it crawled from a trailer being pulled by a pickup truck that had been stopped for driving erratically and hitting other cars. POMPANO BEACH, Fla. (AP) — The Florida Highway Patrol has shut down a portion of Interstate 95 in South Florida after a crash involving a woman who witnesses say was run over by multiple vehicles. Troopers were called to the scene north of Fort Lauderdale early Friday morning. A witness tells Miami television station WSVN that he was driving south on the interstate and saw what looked like a body "laying across the road." He said he "couldn't react in time" and ran over it. ORLANDO, Fla. (AP) — Authorities say a barking dog startled an 11-year-old girl, who stepped off the sidewalk and into the path of a car near Orlando. Florida Highway Patrol Lt. Kim Montes said in a news release that Nunka Exantus was taken to Arnold Palmer Hospital for Children in Orlando on Thursday morning. She said the girl had serious injuries. Montes said 31-year-old Sury Vasquez Benitez was not able to stop her pickup truck in time to avoid hitting the child. HOBE SOUND, Fla. (AP) — A Florida Highway Patrol trooper who was hit by a car while pushing another man out of danger is recovering in a hospital. Rony Bottex says he "would be gone" if it weren't for Trooper Mithil Patel's actions Monday morning along Interstate 95 near West Palm Beach. HOBE SOUND, Fla. (AP) — The Florida Highway Patrol says a trooper has been seriously injured while investigating a crash along Interstate 95. Lt. Alvaro Feola says the trooper was standing in a northbound lane early Monday when he was struck by a car. Feola says the trooper was taken as a "trauma alert" to St. Mary's Medical Center in West Palm Beach. 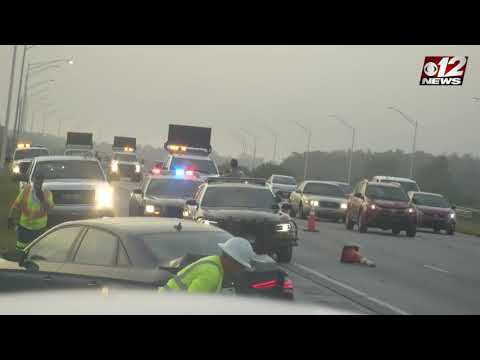 TAMPA, Fla. (AP) — The Florida Highway Patrol says workers picking up trash along Interstate 275 in Tampa found a man's body. SUMMERFIELD, Fla. (AP) — Authorities say no injuries were reported when a Florida school bus driver backed into an SUV after apparently missing a turn. The Ocala Star-Banner reports that the crash occurred Wednesday in Summerfield. FORT MYERS, Fla. (AP) — Authorities in Florida say a toddler died when the family's van rolled over him in the driveway of their home in Fort Myers. The News-Press reports 22-month-old Pedro Oxlaj Juanta was killed Sunday. DAYTONA BEACH, Fla. (AP) — Florida authorities say Casey Anthony's father has been hospitalized after a car accident. The Florida Highway Patrol says in a report that George Anthony's SUV rolled over several times after he lost control Saturday night while traveling on Interstate 4 between Daytona Beach and Orlando. According to troopers, Anthony didn't remember what happened before the crash. WESTON, Fla. (AP) — Authorities say a 23-year-old woman is dead after driving the wrong way on Interstate 75 in South Florida and crashing into a pickup truck. Florida Highway Patrol Lt. Alvaro Feola says it appears Flavia Pinto of Pembroke Pines was driving south in the northbound lanes early Tuesday when she crashed into the truck just east of the intersection with U.S. 27.